A paper mill and its workers helped build the town of Canton and paved the way for innovation. A work whistle has blown over downtown Canton for three generations, but Wayne Carson, a lifelong town resident and longtime employee of Champion Paper and Fibre Company, is deaf to its call. Familiarity is as much to blame as anything, Carson says. The whistle is as big a part of the landscape as the setting sun or the not-so-distant flow of the Pigeon River. And the salty steam that plumes from the cylinders of the paper plant isn’t caustic to him. It’s a sweet reminder of Carson’s finest days and some of the best times in his hometown’s history when the mill employed as many as 8,000 people. In the early- to mid-1900s, the mill was a booming operation with a legacy. It was the South’s first book mill. In the ’50s, it housed the world’s largest machines for making white paper. Three days a week, Carson memorializes those bygone years by standing over the hundreds of black-and-white photographs that memorialize them. He curates the Champion collection at the Canton Area Historical Museum, cataloging newspaper clippings and company records and storing them in Kool cigarette boxes and strawberry crates. The museum is housed in the shadow of the plant’s sprawling work yard in an old town library. Carson displays wares he collected from the nearby Pisgah Forest — dirt-covered, sometimes decaying ax heads and saw blades, relics from the early 20th-century logging operations that first put Canton on the map. He affixes photographs of men wearing wide-brimmed hats and coveralls to foam board and organizes them according to descriptions of the logging camps where they worked. Other photos show the machinery and revelry of later factory life. And mismatched curio cabinets showcase a wide collection of Champion collectibles — rings, candleholders, dishes, watches. 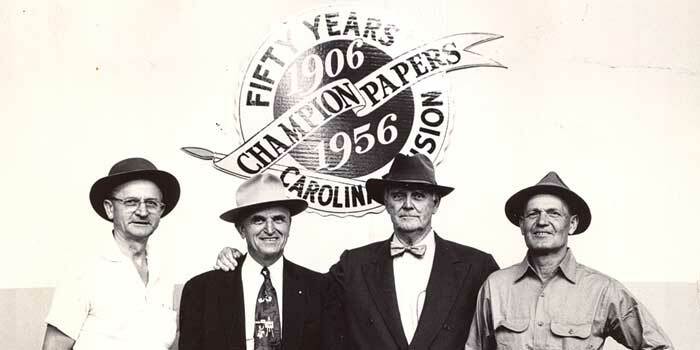 Newsletters, company logs, and records tell the story of Champion’s early years. Champion Coated Paper Company was founded in Cincinnati in 1893 by Peter G. Thomson. A publisher by trade, Thomson saw changes on the horizon for the printing process, namely technology that required smoother paper than was readily available. Thomson responded by opening his first paper plant in Hamilton, Ohio, purchasing pulp from places like New York, Pennsylvania, and West Virginia. But then Thomson began to explore buying his own pulp mill. Canton had barely more than 200 residents in 1905 when Thomson bought a mill site and 25,000 acres of spruce-bearing western North Carolina mountainside in what is now Pisgah National Forest. It was ideally located — a straight route by rail to Champion’s mills in Hamilton. But the workforce of Canton’s mountain people became the business’s best asset. By January 1908, construction was complete, and Thomson turned over the pulp mill operation to his son-in-law Reuben Robertson. Robertson’s leadership carried the company through its best days, pioneering processes that became crucial to the papermaking industry worldwide. Champion was the first in the world to make white pulp from chestnut wood. It was also the first paper mill in the South to make spruce sulfite, which is the dark, syrup-colored tree extract used to tan leather. And Champion employed a technical research division, one of the first in the industry, dramatically improving quality and production cost in papermaking. For his innovation and leadership during this time, Robertson earned the nickname Mr. Champion. If there is a modern-day Mr. Champion, it’s Carson. He’s seen the town’s population rise and fall with the mill’s success; it currently holds at about 4,000 residents. Carson started in the transfer pool at Champion as a 20-year-old in 1959 and spent 36 years working in various roles at the plant, everything from chip stage to quality control and pulp testing. His right arm still bears the scars of hanging in a conveyor belt — an accident that dangled him upside-down over the plant floor before the belt released him and dropped him to the ground. Carson spent another 18 years as a loyal employee after his accident despite being able to move his right arm only about six inches up and down. Today he’s content to attend annual Old Timers gatherings, where hundreds of Champion retirees reminisce about square-dancing competitions and bowling leagues at the YMCA; lunches at the plant canteen of hot dogs and sodas from the company store; and picnics, parades, and practical jokes. And they remember when their jobs were to turn Carolina wood chips into some of the finest paper in the world. Before the whistle blew. Heidi Coryell Williams lives in Clemson, South Carolina. She has written for Spirit Magazine (Southwest Airlines), TOWN, WNC, and Home Furnishings Executive. Her most recent story for Our State was “Batman of Swain County” (October 2011).